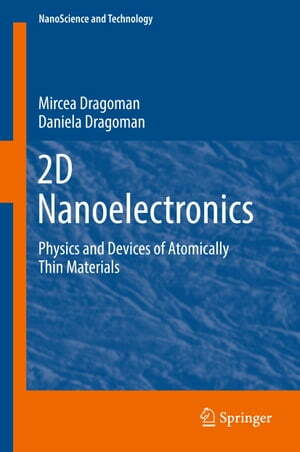 Collins Booksellers - 2D Nanoelectronics by Mircea Dragoman & Daniela Dragoman, 9783319484372. Buy this book online. This book is dedicated to the new two-dimensional one-atomic-layer-thick materials such as graphene, metallic chalcogenides, silicene and other 2D materials. The book describes their main physical properties and applications in nanoelctronics, photonics, sensing and computing. A large part of the book deals with graphene and its amazing physical properties. Another important part of the book deals with semiconductor monolayers such as MoS2 with impressive applications in photonics, and electronics. Silicene and germanene are the atom-thick counterparts of silicon and germanium with impressive applications in electronics and photonics which are still unexplored. Consideration of two-dimensional electron gas devices conclude the treatment. The physics of 2DEG is explained in detail and the applications in THz and IR region are discussed. Both authors are working currently on these 2D materials developing theory and applications.